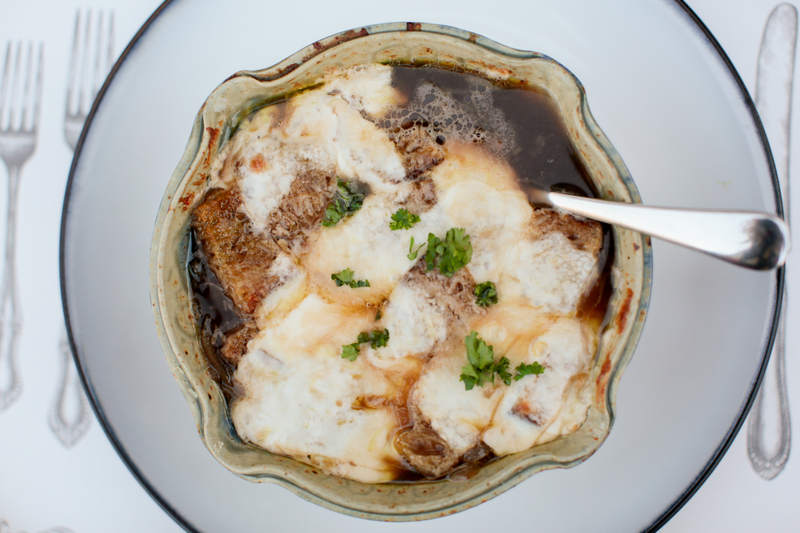 For me, there is something so warming and delicious in French Onion Soup. I don’t know who came up with the idea of putting cheese in a clear broth but its seriously genius. The gooey melted cheese coupled with the rich beef broth and bread…ah such a delight. I use to work in a restaurant that served french onion soup and I came home smelling like it every night. But it was worth it because I got to eat it all the time. I hope you enjoy and call me if you make this because I never get sick of it. I’ll be over in a flash! In a large stockpot on medium-high heat, sauté the onions with the butter, olive oil and bay leaf for 20 minutes, until the onions turn a rich golden brown color. Deglaze the pan with the red wine and marsala and simmer uncovered for 5 minutes. Add the white wine and simmer uncovered for 15 more minutes. Add the beef stock plus salt and pepper. Bring to a boil, then simmer uncovered for 20 minutes. Remove bay leaf and spoon soup into individual oven safe bowls. Top with croutons,mozzarella slices and grated parmesan cheese. Bake until cheese is melted over croutons. Be careful when taking the bowls out of the oven and serve on individual plates. Make sure you let your guests know the bowls are hot. Enjoy!